This post was written by Climate Programs Intern Egiimaa Munkhdalai. Aviation is a significant contributor to climate change. Emissions from aviation continue to grow. In fact, CO2 emissions from international aviation have increased by 83% since 1990. However, it is challenging to address the issue since most people cannot give up traveling completely. This is one of the reasons for CORSIA, the Carbon Offsetting and Reduction Scheme for International Aviation. CORSIA is set to reduce carbon emission in the aviation industry through offsetting and innovative solutions such as renewable jet fuel. 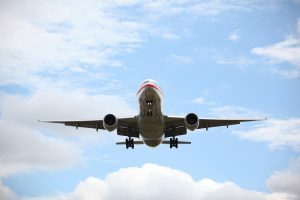 CORSIA, which has two phases, will offset increases in carbon emissions from international flights after 2020. In the first phase, which is from 2021 to 2026, only countries that volunteered to participate will have to implement carbon credits. However, starting in 2027, it will become mandatory for all international flights to offset their carbon emissions. Airlines can counteract the damage caused by emissions by purchasing carbon credits, or by offering carbon offset programs for their passengers. Some airlines including Delta, United, and JetBlue have already started to do so in the United States. Passengers who want to neutralize CO2 emissions from their flights pay an extra price on their tickets or donate their miles. Airlines set up an emission calculator on their websites where passengers can estimate carbon outputs from their flights. Generally, the money passengers pay goes to support both domestic and international environmentally sustainable projects that will reduce carbon emissions. Airlines usually collaborate with environmental non-profit organizations when offering voluntary offset programs. For instance, Delta partners with The Nature Conservancy and sends donation from its passengers to The Nature Conservancy forest protection projects. United works with Sustainable Travel International and supports their carbon offset projects that are verified by independent third parties. What does this mean for campuses? Flying is an integral part of campus operations as faculty and students need to travel for academic and professional purposes. Even though CORSIA shows promise in reducing carbon emission, it does not kick into effect until 2021 and it only covers international flights. Therefore, there is little immediate change for campuses. But the fact that more airlines are taking action to offer passenger offsetting programs might help campuses to take advantage of these programs. Campuses can encourage their employees and students to purchase offsets. Schools can also purchase their own carbon credits to offset air travel, which could potentially reduce their Scope 3 emissions. Some schools are doing this by adding an extra fee to the price of air miles. For instance, Arizona State University (ASU) adds on $8 to all ASU round-trip travels to offset 44,000 metric tons of emission each year. Carbon offsetting makes regular tickets a little more expensive to reflect true environmental costs. However, it is an effective way to sequester carbon in the atmosphere and contribute to overall emission reductions in the long-term when flying is a necessary part of life.